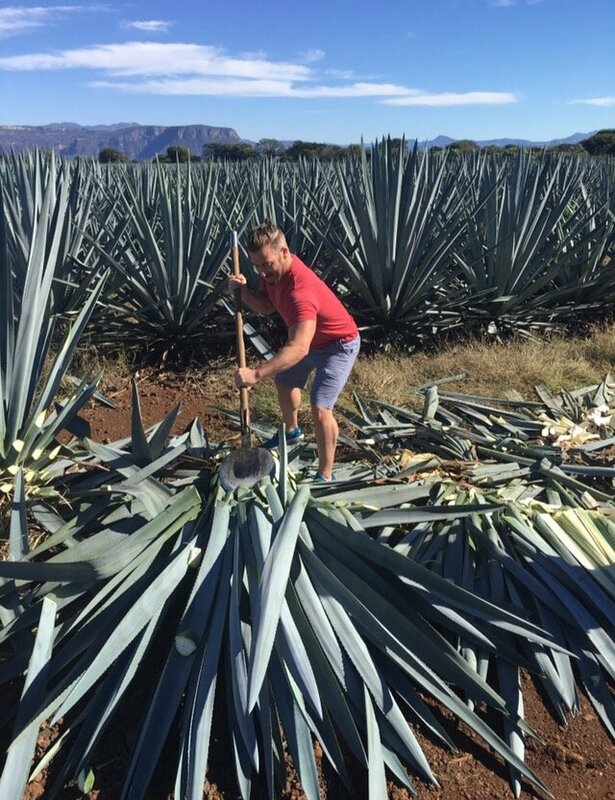 Learn about the experience of walking through the fields of agave, and discover tequila experiences of making Tequila live. Tourists surround the guide, who tries to train your eyes to differentiate between a agave ready to cut and one that lacks maturity another 6 years. When we learned to identify them, he showed us how to get fucked (they cut 150 magueyes a day), and the bravest took the coa and cut the root of the agave until freeing the pineapple. To continue our tour of the factory they gave us hearing aids, they put us equipment of security and sanity to continue with the route of the tequila Altos. As soon as we entered, the heat began to make their own, we walked through the safety zone and we saw, step by step, how this drink is made. After they bring the pineapples they are fermented in large boilers for hours (we feel the heat and the strong smell that came from the fermentation), then we go to the cellar where they have the barrels, finally, we observe how they label the bottles and put them in boxes. To end our experience, we were given a tequila tasting, where they taught our senses to differentiate the types of tequila and to distinguish the flavor of Altos (which has a softer flavor), which is 100% handmade agave, which gives that soft tone, fruity aromas and herbal notes. The Jose Cuervo Express train offers 2 new itinerary options to travel from Guadalajara to Tequila every Saturday of the year; traveling 60 km of agavero landscape. The experience includes the train trip from Ferromex to Tequila, the tour of the José Cuervo tequila factory and Mexican show. The tequila tour begins with a tour on the train at Guadalajara Tequila, then the visit to the factory and the La Rojeña distillery, you are presented with a Mexican show, a lottery game on board the train, lunch type food, and a toast with the premium tequila. You need to book 5 days in advance, and you can complement your experience with a tequila tasting, a chocolate tasting, and pack your own bottle. The entire tour lasts 12 hours. What better way to start this unique experience than with a train trip from Guadalajara. Take Jose Cuervo Express, the only old-style train in Mexico that will take you to the magical town of Tequila. The trip includes tequila tasting, traditional cocktails, Mexican shows and typical games. You will also love the view of the beautiful landscapes of the blue agave fields. In the Express Experience you will make the trip by train and you can taste the cocktails of Casa Jose Cuervo. During the Premium Experience you will travel in the premium cars and enjoy the premium bar of the House. The dry snack is included. You will attend a magnificent Mexican party to be held at Hacienda el Centenario. There will be Mexican verbena, mariachi and live DJ, pyrotechnic games and Mexican buffet. Neglect, if you stressed too much, when you return aboard Jose Cuervo Express they will have ready-made food to get you down. The Express experience has a cost of $ 2,650 pesos per person and the Premium $ 2,950 (includes taxes). After an unforgettable Mexican night, take advantage of your visit to Tequila, Jalisco and stay at the best hotel in the region. You will have a preferential rate at Hotel Solar de las Animas which includes room superior category double, free access to the facilities: sauna, Sky Bar, Bar Chucho Reyes and swimming pool. In addition you will attend the concert of Dina Buendia, ambassador of Mexican music, on September 16. The price per room per night is $ 2,150 pesos (plus tax) for a minimum stay of two nights. The magical town of Tequila, Jalisco, is world renowned for the production of the distillate to which it gives denomination of origin. The land of agave and jima is another gem to the west of Mexico and we want you to live it in all its splendor. On this occasion we recommend 5 activities full of tequila tradition to discover the magic of the emblematic Jalisco region. La Rojeña is a distillery that has been producing tequila for over 250 years. Here you will witness the whole production process, from the masonry ovens for the cooking of the agave to the aging rooms where thousands of barrels are stacked. The house of the National Tequila Museum dates back to the time of Don Porfirio, at the end of the 19th century. The Museum has 5 permanent rooms: Room of origins that tells the pre-Hispanic history of tequila. The denomination of origin room, where you will know why the drink is unique in the world. In the room Industiral process will contrast the current production process and in its beginnings. Another room is the Classification of Tequila, which instructs on the types of tequila and variety in the region. The Arte Tequila room shows the 2 bottles awarded the Guinness record, being the largest in the world. The warmth of the restaurant La Antigua Casona comes from its decoration and the aromas of its typical cuisine. Breakfast is buffet on weekends! The chef puts his stamp on every dish of the menu, whether regional with organic ingredients, contemporary Mexican haute cuisine or an international specialty. The bar of this restaurant serves a menu of cocktails based on tequila, wines, spirits, liqueurs and beers. Explore the most emblematic streets of the magical town of Tequila, the laundries and the abandoned factories of the ghost town. You will know all the stories and legends told by an expert guide. If you want to live the magic and tradition that the magical town of Tequila hides, discover Cuervo Crowd, the hospitality and tourism division of Jose Cuervo. With the Weekend Getaway package you will enjoy your visit to Tequila to the best price. The tour consists of a trip in the Jose Cuervo Express and the guided visit to La Rojeña. You will stay at the Hotel Solar de las Animas, one of the most ambitious tourist centers in Tequila history and perfectly located. The two itinerary options are: “Sing and do not cry” (from Friday to Saturday) and “Bésame Mucho” (from Saturday to Sunday). Both include the train experience, an overnight stay at the hotel, welcome cocktail with snack in the Sky Bar Restaurant, continental breakfast, four-course dinner in the Antigua Casona Restaurant and an hour of free bar of the best tequilas of home! Prices range from $ 3,888.00 pesos per person (plus taxes). For lovers of mixology with tequila, we are going to teach you how to prepare a cocktail lord because we are good vibe. It’s called Ginger Barrel. Before getting into the subject, let’s take a moment to know the essence of this cocktail: Tequila Hornitos Black Barrel! It is a premium aged 100% agave Tequila, aged for 24 months in American white oak barrels burnt and toasted in the Scottish style. Just to make your mouth water. It has an amber colorcito with a slightly olive green hue. Its aroma is maple honey, vanilla, chocolate, hazelnut, wood, coconut and a slight smoky touch. When you taste it, you perceive a subtly acidic woody flavor, a little roasted oak and cooked agave. Have we convinced you? Organize the tour of the tequila where they take you to know the factory, where they will tell you the history and the process of tequila Herradura. It includes a live jima, the visit to the museum and a tasting. There are tours every day, and from there you are taken to Hacienda Casa Herradura. You go the factory to know the process of elaboration and finally the tasting. This tour costs $ 990, if they go from two to three people, and take you to know the Tequila Factory, the ceramic factory (where you can design your bottle and paint it), visit the Tequila Museum, visit the cava store, taste tequilas and a meal of three times. If this tour does not beat you, you can hire someone else; to do any of its many activities, or to dine in its tavern, which is located 4.5 meters underground – with a menu of five states of the Republic.